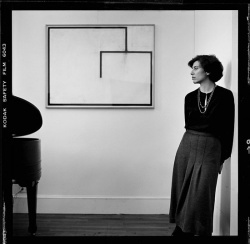 Rosalind Epstein Krauss (1941) is an American art critic and theorist. She is a professor at Columbia University in New York City. Terminal Iron Works: The Sculpture of David Smith, MIT Press, 1971. Revised from her PhD dissertation, The Sculpture of David Smith (1969). Passages in Modern Sculpture, MIT Press, 1977, ix+308 pp; New York: Viking, 1977, PDF. The Originality of the Avant-Garde and Other Modernist Myths, MIT Press, 1985, xii+307 pp. A collection of essays written between 1977-84. Reviews: Bois (AJ 1985). Wiseman (JAE 1986), Partington (OAJ 1986), Karp (JAAC 1988). with Jane Livingston, L'Amour fou: Photography & Surrealism, Washington, D.C.: Corcoran Gallery of Art, and New York: Abbeville Press, 1985, 243 pp. Catalogue for exh. held Sep-Nov 1985. First Krauss' essay. The Optical Unconscious, MIT Press, 1993, 365 pp. Reviews: Horowitz (JAAC 1994), Fer (ArtHist 1994), Smith (M/M 1995). Commentary: Kimball (1993), Elkins (2013), Carlson (2014). Cindy Sherman: 1979-1993, New York: Rizzoli, 1993, 240 pp. With an essay by Norman Bryson. Excerpt. Formless: A User's Guide, Zone Books, 1997, 304 pp. Bachelors, MIT Press, 1999, 228 pp, ARG. Reviews: Elkins (CAA 1999), Andersson (Leonardo 2000). The Picasso Papers, MIT Press, 1999, xvi+272 pp, PDF, ARG. Review: McCully (NY Books, 1999, reply by Cooper). A Voyage on the North Sea: Art in the Age of the Post-Medium Condition, London: Thames & Hudson, 2000, 64 pp, ARG. Based on the 1999 Walter Neurath Memorial Lecture. with Hal Foster, Yve-Alain Bois, and Benjamin H. D. Buchloh, Art Since 1900: Modernism, Antimodernism, Postmodernism, London: Thames & Hudson, 2004, 704 pp; 2nd ed., rev., 2012, 816 pp; 3rd ed., upd. & exp., 2016, 896 pp. Reviews: Bishop (2005), Collings (2005), Gewen (2005), Bryson (2005), Karmel (2005), Sá (2005 PT), Richard (LRB 2006), Dahlberg (2006). Perpetual Inventory, MIT Press, 2010, 320 pp. TOC, Excerpt, . Reviews: Trodd (Oxford Art J), Bowman (Art Hist), Ione (Leonardo). Under Blue Cup, MIT Press, 2011, ARG, PDF. October journal, New York, since Spring 1976. The Sculpture of David Smith: A Catalogue Raisonné, New York: Garland, 1977. Revised from her PhD dissertation, The Sculpture of David Smith (1969). with Annette Michelson, Douglas Crimp, and Joan Copjec, October: The First Decade, MIT Press, 1987, 468 pp. with Annette Michelson, Yve-Alain Bois, Benjamin H.D. Buchloh, Hal Foster, Denis Hollier, and Silvia Kolbowski, October: The Second Decade, 1986-1996, MIT Press, 1997, ARG. "Sense and Sensibility: Reflection on Post '60s Sculpture", Artforum 12:3, Nov 1973, pp 43-53, ARG. "Video: The Aesthetics of Narcissism", October 1 (Spring 1976), pp 50-64. "Notes on the Index: Seventies Art in America", October 3 (Spring 1977), pp 68-81; repr. as "Notes on the Index: Part 1", in Krauss, The Originality of the Avant-Garde, 1985, pp 196-209. "Notes on the Index: Seventies Art in America. Part 2", October 4 (Autumn 1977), pp 58-67; repr. as "Notes on the Index: Part 2", in Krauss, The Originality of the Avant-Garde, 1985, pp 210-219. "Tracing Nadar", October 5: "Photography" (Summer 1978), pp 29-47. "LeWitt in Progress", 1978; repr. in Krauss, The Originality of the Avant-Garde, 1985, pp 244-258. "Sculpture in the Expanded Field", October 8 (Spring 1979), pp 30-44, ARG; repr. in The Anti-Aesthetic: Essays on Postmodern Culture, ed. Hal Foster, Seattle: Bay Press, 1983, pp 31-42; repr. in Krauss, The Originality of the Avant-Garde, 1985, pp 276-291; repr. in Postmodern Culture, ed. Hal Foster, London: Pluto, 1985, pp 31-42; repr. in Theories of Contemporary Art, ed. Richard Hertz, Englewood Cliffs, NJ: Prentice-Hall, 1985, pp 215-224. "La escultura en el campo expandido", in La posmodernidad, ed. Hal Foster, Barcelona: Kairós, 1985, pp 59-74. "Grids", October 9 (Summer 1979), pp 50-64; repr. in Krauss, The Originality of the Avant-Garde, 1985, pp 8-22. "Poststructuralism and the Paraliterary", 1980; repr. in Krauss, The Originality of the Avant-Garde, 1985, pp 291-295. "In the Name of Picasso", October 16, "Art World Follies" (Spring 1981), pp 5-22; repr. in Krauss, The Originality of the Avant-Garde, 1985, pp 23-40. "Nightwalkers", Art Journal 41:1 (Spring 1981), pp 33-38. "The Originality of the Avant-Garde: A Postmodernist Repetition", October 18 (Fall 1981), pp 47-66; repr. in Art After Modernism: Rethinking Representation, ed. Brian Wallis, New York: New York Museum of Contemporary Art, and Boston: Godine, 1984, pp 12-29; repr. as "The Originality of the Avant Garde", in Krauss, The Originality of the Avant-Garde, 1985, pp 151-170. Written for 'The Theory of the Avant-Garde', a conference held at the University of Iowa, April 9-11, 1981. "The Photographic Conditions of Surrealism", October 19 (Winter 1981), pp 15-34; repr. in Krauss, The Originality of the Avant-Garde, 1985, pp 87-118. "This New Art: To Draw in Space", in Julio Gonzalez: Sculpture & Drawings, October 2-31, 1981, New York: Pace Gallery, 1981, pp [1-6]; repr. in Krauss, The Originality of the Avant-Garde, 1985, pp 119-129. "Contra Carmean: The Abstract Pollock", Art in America 70:6 (Summer 1982), pp 123-131 & 123-131 & 155; repr. as "Reading Jackson Pollock, Abstractly", in Krauss, The Originality of the Avant-Garde, 1985, pp 221-242. "Photography's Discursive Spaces: Landscape/View", Art Journal 42:4 (Winter 1982), pp 311-319, ARG; repr. in Krauss, The Originality of the Avant-Garde, 1985, pp 131-150. "Sincerely Yours: A Reply", October 20 (1982), pp 111-130; repr. in Krauss, The Originality of the Avant-Garde, 1985, pp 171-194. Response to Albert E. Elsen's article on National Gallery casting of Rodin's Gates of Hell, "On the Question of Originality: A Letter", October 20 (Spring 1982), pp 107-109, which commented on Rosalind Krauss' "The Originality of the Avant-Garde" (1981). "When Words Fail", October 22 (Autumn 1982), pp 91-103. When Words Fail was organized by the International Center of Photography and the Goethe House, February 19-21, 1982; it coincided with two exhibitions mounted at the ICP: Avant-Garde Photography in Germany: 1919-1939, and Heinrich Kühn: Turn-of-the-Century Master; this essay is a modified version of the paper read by Rosalind Krauss at the Colloquium When Words Fail in a session devoted to the stylistic results of the new camera technologies of the 1920s. "Richard Serra, a Translation", in Krauss, The Originality of the Avant-Garde, 1985, pp 260-274. "Objects of My Attention", in Man Ray: Objects of My Attention, New York: Zabriskie Gallery, 1985, pp [1-6]. Written in 1983; catalogue text. "A Note on Photography and the Simulacral", October 31 (Winter 1984), pp 49-68. A version of this essay was delivered as the keynote address for the National Conference of the Society for Photographic Education in Philadelphia, March 1983. "Giacometti", in `Primitivism' in 20th Century Art: Affinity of the Tribal and the Modern, vol. II, ed. William Rubin, , New York: Museum of Modern Art/New York Graphic Society Books, and Boston: Little, Brown, 1984, pp 502-533; repr. as "No More Play", in Krauss, The Originality of the Avant-Garde, 1985, pp 42-85. "Corpus Delicti", in Krauss, Livingston, L'Amour fou: Photography & Surrealism, 1985, pp 57-114; repr. in October 33 (Summer 1985), pp 31-72, ARG. "Photography in the Service of Surrealism", in Krauss, Livingston, L'Amour fou: Photography & Surrealism, 1985, pp 13-42. "Photography's Exquisite Corpse", in In the Mind's Eye: Dada and Surrealism, ed. Terry Ann R. Neff, Chicago: Museum of Contemporary Art, and New York: Abbeville Press, 1985, pp 43-61. Catalogue text. "Preying on `Primitivism'", Art and Text 17 (Apr 1985), pp 11-12 & 58-62. "Antivision", October 36: "Georges Bataille" (Spring 1986), pp 147-154. "The Cultural Logic of the Late Capitalist Museum", October 54 (Autumn 1990), pp 3-17; repr. in Guglielmo Cinque, Types of Dependencies, MIT Press, 1990. "Motivation of the Sign", in Picasso and Braque: A Symposium, ed. Lynn Zelevansky, New York: Museum of Modern Art, 1992, pp 261-286. "Welcome to the Cultural Revolution", October 77 (Summer 1996), pp 83-96. "'Informe' without Conclusion", October 78 (Autumn 1996), pp 89-105. "Postmodernism’s Museum Without Walls", in Thinking About Exhibitions, eds. R. Greenberg, B. Ferguson and S. Nairne, London: Routledge, 1996; 2005, pp 241-245. "Perpetual Inventory", October 88, Spring 1999, pp 86-116. "Reinventing the Medium", Critical Inquiry 25:2: "'Angelus Novus': Perspectives on Walter Benjamin" (Winter 1999), pp 289-305. "'Specific' Objects", RES: Anthropology and Aesthetics 46: "Polemical Objects" (Autumn 2004), pp 221-224. "Two Moments from the Post-Medium Condition", October 116 (Spring 2006), pp 55-62. "Dialectic of Enlightenment: Rosalind E. Krauss on William Kentridge's Norton Lectures", Artforum International (Summer 2012), pp 121-122. Eddie Yeghiayan, "Rosalind Krauss. A Selected Bibliography", 2000.
in French, 26 July 2011. Paul Taylor, "Rosalind Krauss", Art and Text 8 (Summer 1982-83), pp 31-37.
with Yve-Alain Bois and Douglas Crimp, "A Conversation with Hans Haacke", October 30, Autumn 1984, pp 23-48. David Plante, "The Real Thing: An Interview with Rosalind E. Krauss" , ArtCritical, 2013. "Rosalind Krauss", in Judy K. Collischan Van Wagner, Women Shaping Art: Profiles of Power, New York: Praeger, 1984, pp 149-164. Scott Rothkopf, "Krauss and the Art of Cultural Controversy", The Harvard Crimson, 16 May 1997. Anna C. Chave, "Minimalism and Biography", Art Bulletin (Mar 2000). David Carrier, Rosalind Krauss and American Philosophical Art Criticism, Greenwood Publishing, 2002. David Raskin, "The Shiny Illusionism of Krauss and Judd", Art Journal (Spring 2006). Texts on Rosalind Krauss, compiled by Eddie Yeghiayan. This page was last modified on 30 March 2019, at 23:56. This page has been accessed 53,601 times.